When it comes to washing carpets, the Vax ECJ1PAV1 Rapid Power Advance Carpet Cleaner is shaking up the market. Thanks to its combination of surprising effectiveness and modest price tag, it outshines most rental cleaners we’ve seen. When the cleaner arrived, we were surprised at how heavy it was. 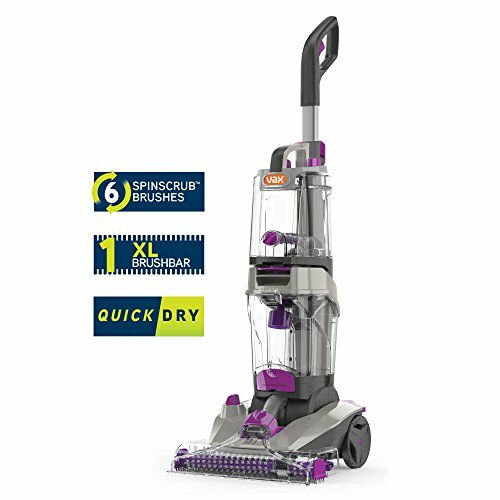 Weighing 8.9 kg, it’s significantly larger than most other consumer cleaners. In the Vax carpet cleaner range, most models are around 5.8kg, although the popular V124A weighs in at 11.5kg. As you’d expect with that kind of bulk, it is very well-built. Aside from the wheels (which honestly seem as though they could have been attached a little better), the Vax Rapid Power is sturdy and feels as though it’s going to last. The design is, obviously, lifted from any traditional hoover build, and the benefit of this is that you can move it around with relative ease. 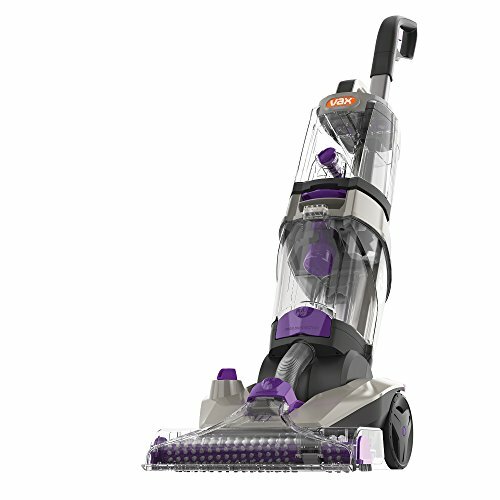 Compared to a handheld Dyson, it’s definitely a little more restrictive in terms of how it’s maneuvered – but, compared to the bulkier cleans we generally test, or even scrubbing on your hands and knees – it feels fine. The bottom of the unit has a 360 degree rotating brushbar, and behind that there are six separate SpinScrub brushes too. 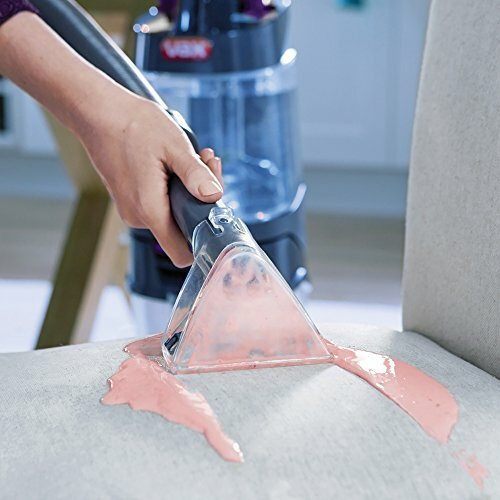 The idea is that they both cover any spots you’re cleaning, working together with the appropriate cleaning solution (of which two 250ml bottles are included) to break down and remove dirt and stains lodged within the fibres of your carpet. For upholstery cleaning, there’s a wash tool and stretch hose that can be used to clean harder to reach – or even elevated – spots. Aside from upholstery, it can also be used to give your car or stairs a good clean, too. There’s a button here to allow you to spray the cleaning formula before applying the wash tool, and the hose it’s all attached to is adequate (though you’ll still need to keep the cleaner fairly close to you). The water tank (which you fill before cleaning) can hold up to 2.7 litres of clean water, or 1.5 litres of dirty water. When full, it definitely contributes to the significant weight of the unit. We spent time trying the Vax out on a variety of carpets, including ones which had never been properly cleaned since they were installed years ago, and another which belonged to the owner of two longhair cats. In short: this cleaner is going to do as good – if not a better job – than most rental units you’re looking at. It can make stained carpets look like new, and the quick clean mode allows for surfaces to be dry an hour after cleaning. After reading other user reviews, we stuck to using around 50ml of the included solution when cleaning, and found that the results were just as good as any other time we’d tested it. In fact, we even tried this out on an old carpet that had been lying dormant in a mouldy shed for years, and it was restored to a somewhat usable state. Again and again, we were impressed by what it could do. The fact that it could take a fairly disgusting surface and make it look as though it had always been well cared for – as well as its ability to make our own carpets look so fantastic – for such a reasonable price is still a little hard to believe. There’s not enough good things we can say about this product. Even if you think you might only use it twice per year, it will pay for itself when you factor in all the costs involved with renting a unit. It’s effective, easy to move around, and affordable to use (even with the cost of buying cleaning solution considered). Do yourself a favour and buy one today.